Earlier this year, I laid out the reasons I believed the gold miners were no longer a good proxy for the metal itself. The change occurred when the SPDR Gold Shares Trust exchange-traded fund gave professional and amateur investors a fast, cheap and easy way to gain instant exposure to gold. Sure, the ETF has internal costs and an expense ratio of 40 basis points, but it is simple and clean and has far less hair on it than the miners did. Why bother investing in a company saddled with the overhead cost of running a mine and error-prone, overpaid management, when you could instantly buy a stake in gold without any of the complications? Incidentally, in August 2011, the Gold ETF had assets of more than $77 billion, surpassing the S&P 500 ETF for about 11 seconds. GLD was, for a very short time, the world’s biggest exchange-traded fund, as the SPDR Gold Trust’s market capitalization rose to $76.7 billion and gold topped $1,880 an ounce. At the same time, SPY’s “capitalization” was a mere $74.4 billion. I wonder how many people caught the world’s biggest contrary signal (I noticed it way after the fact). Before the GLD ETF came on the scene, your best bet for instant gold exposure was the Gold Miner Index. How has that done since inception, and since the creation of GLD? In a word: terrible. The index, which was created in 1993, is down 30 percent since inception and its average annual returns are negative. That is quite the track record for long-term investors. By way of comparison, the S&P 500 (with dividends) is up 618.6 percent for the same time period. Indeed, the Gold Miner Index was negative for most of the 1990s, had a great run in the 2000s, came crashing down during the financial crisis and bounced back during the recovery (and during ZIRP/QE). The introduction of the GLD ETF didn’t really affect it, as both were feasting on rising gold prices. Since the tide has gone out, however, the historical relationship between gold and its miners appears to have broken down. I am tempted to conclude that the miners are a trading vehicle, not an investment. They have great years and terrible years, but not all that many in-between years. If you are nimble and have an opinion of the direction of gold, there is a possible trade here. I am not doing this to beat on gold. Lord knows I have done that enough (see this, this, this, this, this, this, this, this, this, this and of course this). The key point is that if you want to take ownership of gold miners, you better understand what you are doing. You are making a trade, not a long-term investment. 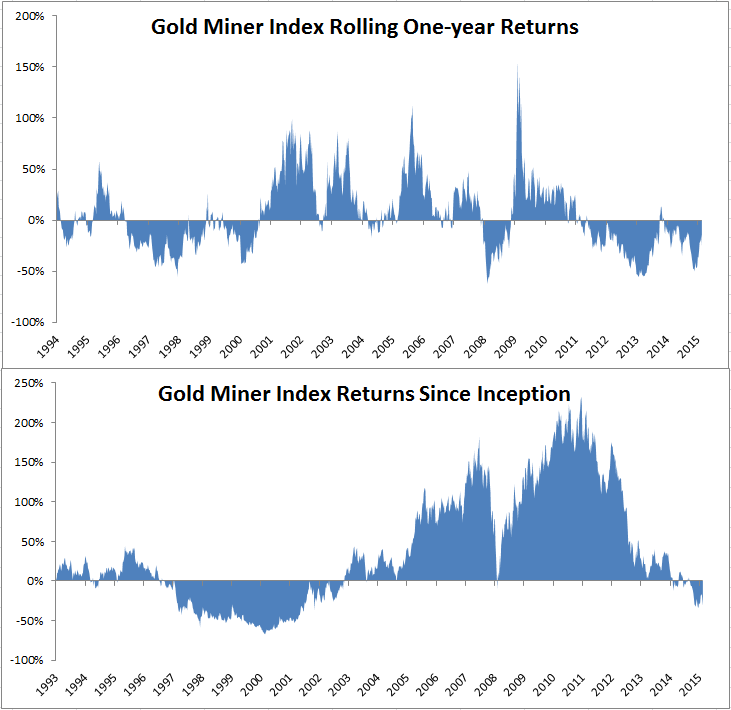 July 16, 2015 How Cheap Are the Gold Miners?